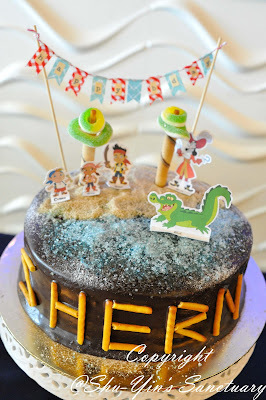 In keeping with tradition, I'd decorated Shern's 4th birthday cake just like his 1st, 2nd, and 3rd birthday cakes. 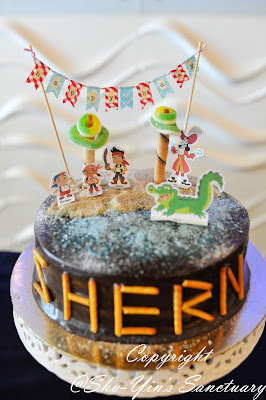 This year, Shern said he wanted the Jake and the Neverland Pirates cake. I think those with kids should be familiar with this Disney's cartoon. It is a non-violent friendly kinda pirate, so I'm pretty ok with this theme. Not the all-skulls-and-death kind of pirates which I think is not suitable for 4yo! Haha. Actually, I did went to ask around the price of a 3D cake. The first nice cake shop I went to told me minimum basic design cake starts from RM500. That price had me running all the way and never even looked back! Crazy! So I did what I always do. I bought the cake (Shern asks for chocolate cake again!) and then I decorated it myself. But as Shern wanted the Jake and the Neverland Pirate theme, it was kinda challenging for me. I'm not a cake decorator, but I wanted to make my son happy. So I decided to find some Jake and friends characters printable online and then just stick them on my cake, and I would make a scene on my cake. Shern actually asked for a scene with waterfall. I think it was too challenging for me. Haha. So I just settled for a "sandy beach by the sea" theme. 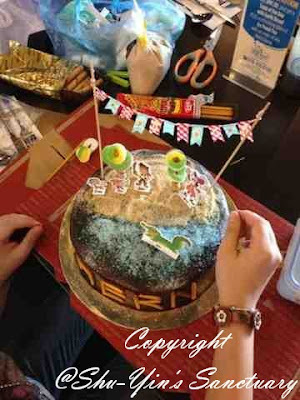 I was cracking my brains thinking how to make the blue sea without using fondant/cream? My first thought was spreading some blue jelly on it. Then eventually decided to use coloured sugar. Saw Cold Storage selling coloured sugar for RM29.90. Wahlao eh...sugar also so expensive. So how? I did not buy of course. I turned to Mr. Google and asked him "how to make coloured sugar". So easy.....just mix 2 drips of blue colouring into the sugar, and voila...blue coloured sugar! I used coarse sugar for better visual. And for the trees, I used a pretz stick inside a chocolate love letter and topped it with 2 green gummy sweets, one big and one small. It ended up kinda heavy and almost toppled over. Lucky it didn't, thanks to my ingenious idea to insert a pretz stick inside the love letter as a stronger base. I think they did look like cartoon trees, right? The pretz sticks were then used again to make up the name S H E R N.
And I made a mini banner that says 'happy bday' using washi tapes and satay sticks. Washi tapes really make my life easier! 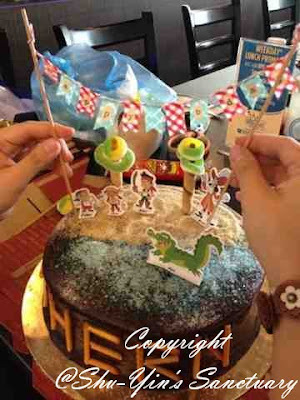 As for Jake, Izzie, Cubby, Captain Hook, and Tick-Tock the crocodile, I poked half a toothpick behind so that they could stand firm onto the cake. This was the final look of the cake. A more closed up photo of the cake, but with low lighting. Photo taken using my phone. Ok, I will talk more about the party once I get my hands on the photos. 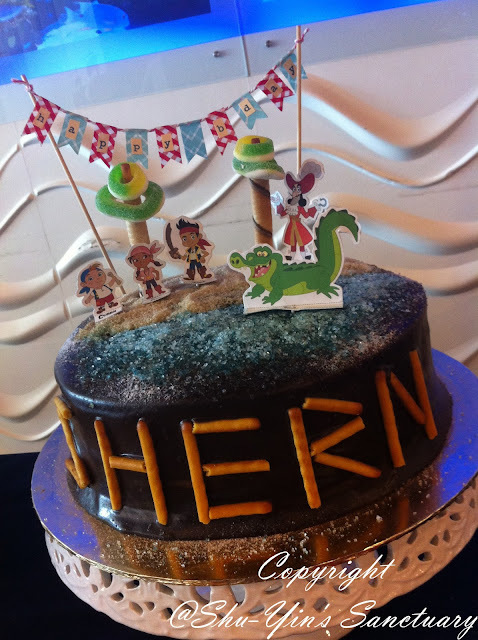 This post is purely dedicated to Shern's one-of-a-kind Jake and the Neverland Pirate 4th Birthday Cake! 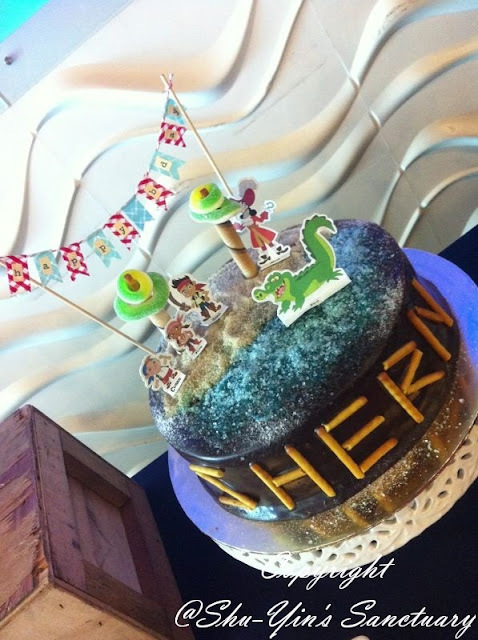 The look on Shern's face when he saw the cake. Awesome. Totally worth it! And he didn't even ask me 'where is the waterfall?' lol. Brilliant idea with the coloured sugar! Simple yet versatile to provide so many decorating options. I’ll definitely keep that one in mind for future decorating options. Thanks for sharing!